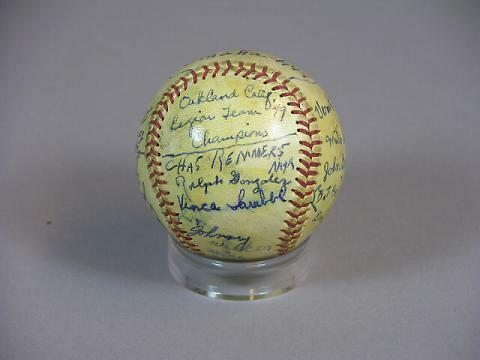 Autographed baseball inscribed "Oakland Calif. Legion Team '49 Champions; Last Ball Omaha - 1949." Signed by Chas Remmers, Mgr. and many players including Cap't. Ray Herrera, Ralph Gonzalez, Johnny Walker, Ron Roberto, Johnny Stratton, Joe Winstead, J.W. Porter, Bob Quinn, and others.